Symptoms involving your digestive system can be uncomfortable and sometimes even a little embarrassing to discuss. My staff and I treat these stomach and rectal symptoms daily for those living in the Fort Worth, TX area, and understand the stress that being unwell can bring. Our team works carefully with patients to effectively diagnose and prescribe the appropriate treatment plan to improve their digestive and overall health. 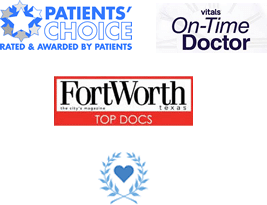 Dr. Yepuri is an expert in diagnosing digestive symptoms and has provided additional information on the most common symptoms that he sees patients for in the Fort Worth, TX area. Click on the symptoms below to learn about causes, remedies and diagnostic procedures that may be used to rule out any serious medical conditions. The only way to be certain of the cause of your digestive symptoms is to be evaluated by a gastroenterologist or primary care doctor. Issues like seeing blood in the toilet can be quite alarming and lead us to think of worse case scenarios like cancer or other serious medical conditions. Typically, the underlying cause of digestive symptoms is something that your doctor can correct or limit the effects of with early detection. I encourage my website visitors to explore the content I’ve created on different symptoms by clicking on the symptoms listed above and contact my practice if they have questions or would like to schedule an appointment to be examined. There is an abundance of possible causes for issues in the digestive system ranging from minor to potentially life threatening. While the only way to accurately know the cause of digestive irregularities is to have a medical examination, I do want to provide some insight for those in the Fort Worth area to consider as they assess the severity of the issue prior to visiting their doctor. Try to pinpoint the triggers that may be causing the problem. Common digestive triggers can be foods, beverages, medications and stress. Keeping a journal of all activities when symptoms occur could help identify foods or events that trigger occurrences. A balanced diet can help to maintain digestive normalcy. Including appropriate portions and types of foods and beverages in one’s diet can assist your digestive tract to function more efficiently and as intended. Avoid potentially transferring harmful bacteria to your food by washing hands after going to the restroom and before preparing food. Stress is often overlooked, but can be very disruptive to your digestive health. However, not all stress can be avoided, so do what you can to lessen the effects with exercise or making time for a favorite pastime. Don’t ignore your symptoms. If symptoms recur, it’s VERY IMPORTANT to have them evaluated by your doctor. The key for lessening the effects of the causes of many digestive symptoms is often early detection. I can’t stress this point enough, and a good example is following the recommended guidelines for colon cancer screening with colonoscopy. When detected in early stages, we can prevent colon polyps from developing into life threatening colon cancer.